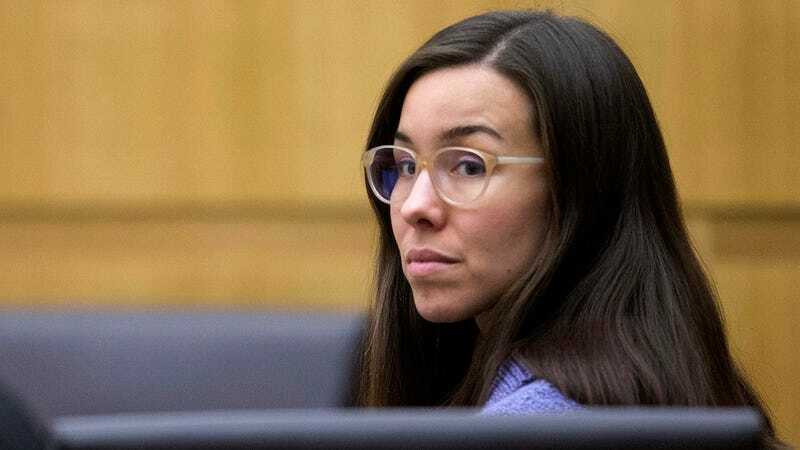 Jodi Arias, who was convicted of the murder of Travis Alexander in 2013, will not be charged with the death penalty after the jury deadlocked on the decision of whether or not she should be executed. The AP reports that today's deadlock "marked the second time a jury was unable to reach a decision on her punishment—a disappointment for prosecutors who argued for the death penalty during the nearly seven-year legal battle. It means the judge will sentence Arias on April 13 to either life in prison or a life term with the possibility of release after 25 years." The family of Alexander—who was found stabbed, shot in the head and with his throat slit in June of 2008—were openly emotional as the judge read the verdict. His siblings have stated, via attorney Jay Beckstead, that they "are saddened by the jury's inability to reach a decision on the death penalty, however, we understand the difficulty of the decision, and have nothing but respect for the jury's time." The jury was in deliberation for five days. Arizona, where Arias is being held on trial, is one of 32 states where the death penalty—an archaic practice that regularly targets, the poor, the mentally ill and people of color—remains legal.